Rajesh Ramani divides his time between his Forensic IT job, protecting his city as Newstreet, and a series of disastrous dates with Birmingham’s eligible bachelorettes. But when a series of technologically-sophisticated bank robberies leads him to a community arts project with complicated motives, what Raj finds might just break his heart – if it doesn’t break his face first! 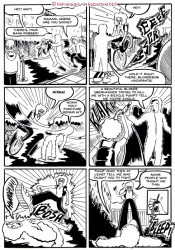 It’s Flight, Fight and Flirt as Birmingham’s kung fu champion meets the supervillain of his dreams! 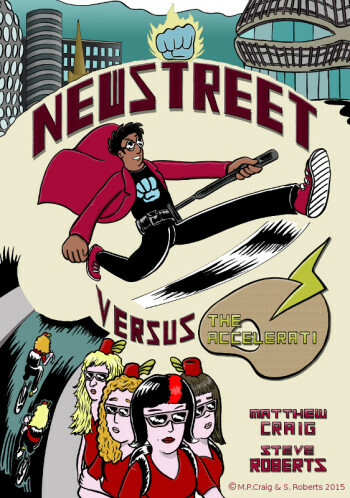 Debuting at The Birmingham Comics Festival, Newstreet vs. 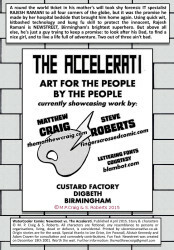 The Accelerati is a 24 page, US-format superhero comic by Matthew Craig (Bayou Arcana, Disconnected Press, New British Comics 3) and Steve Roberts (Fingers Crossed, Matthew Crown). 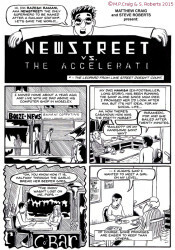 Newstreet is a free PDF download. “There’s a light touch to the writing, a genuine warmth, and some effective, concise character work…There’s a ring of truth to the characterisation: a giddy flutter to hinted-at romance, a sense of real comfort in familial bonds, etc. Human warmth, see? 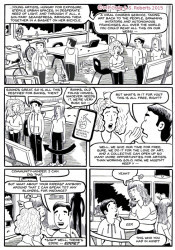 “There’s much to enjoy here…Craig’s first comic in a while and one gets the idea he’s so invested in it he’s almost over-written it. “…full of promise, has a great concept of a local hero, and particularly pleasing, hasn’t bothered wasting time on some origin tale, this is one to jump straight into and pick up on the hop.